Iron bacteria creates a sticky, slimy gel that is usually rusty red in color but may instead be yellow, brown, or gray. Once in a while, we at BC Basement Systems hear from a homeowner who's found a gelatinous, rust-colored substance making its way into a basement. This substance also appears around faucets, in toilet water tanks, and within other plumbing. This substance is called iron ochre and is created as a waste byproduct of iron bacteria. This bacteria naturally occurs in environments throughout most of the world. Iron bacteria survives by oxidizing minerals dissolved from water, most commonly from ferrous iron, but also sometimes from manganese. As it does, it typically creates a reddish-brown slime or ooze, which can potentially be very thick. This thick slime is known to affect drain and plumbing systems of all kinds, presenting a unique challenge for basement waterproofing contractors. When you're ready to solve your iron ochre problem once and for all, we're ready to help! We have specialized drainage systems designed specifically for basements with iron bacteria problems. For a free, no-obligation iron ochre waterproofing system quote, contact us by phone or e-mail today! We serve Kelowna, Kamloops, Vernon, Nelson, Quesnel, Penticton, West Kelowna, Salmon Arm, Castlegar, Williams Lake, Westbank, Trail, Coldstream, Oyama, Armstrong, Chase, Winfield and many nearby areas in British Columbia. As iron ochre grows in pipes, it attaches itself to the sides of pipes and on surfaces, forming layers of reddish sludge or slime. This slime can be found on the ends of faucets, on laundry machine screens, on the insides of water tanks, and inside pumps and plumbing. When the bacteria builds up thickly enough, it can begin to corrode pipes and plumbing equipment. Heavy buildup will also lead to damage to stainless steel surfaces, which are used by the bacteria as an iron source. Once thick layers of bacteria have built up inside pipes, chunks will begin to break away, flowing down the system and leading to clogs. This can happen very quickly -- entire well systems have been known to completely clog in just a few months' time. Iron Ochre (Top) is an ugly, gelatinous slime that stains surfaces and releases a foul odor into the air. Our WaterGuard® IOS System (Bottom) is specialized for draining iron-ochre-laden water. If you believe you may be having a problem with iron ochre in your wet basement, be sure to ask us about our Waterguard IOS (Iron Ochre System). The unique design of this system is ideal for a homeowner who would like to waterproof his or her home but has iron ochre present in the flooding waters. Iron bacteria creates a slime that can clog a basement waterproofing system, causing it to cease to function properly. The Waterguard IOS System® has been created with a removable cover that is visible and flush with the floor, unlike other drainage systems that are installed underneath the floor slab. When maintaining your system, your waterproofing service technician removes this cover, gaining direct access to the drain. This allows them to either scoop out iron ochre or flush it from your system. Maintenance intervals would vary on a home-by-home basis, depending on how severe the iron bacteria problems are. To further prevent clogging, WaterGuard® IOS® is designed with large drainage holes on the side. These will help prevent the drain from clogging with iron-ochre-laden groundwater. Additionally, our sump pump systems are up to the challenge of draining your system, being able to pump out ½" solids. To test for iron bacteria and iron ochre in your water, try this simple procedure. One morning (when your pipes have sat for a while without being used and "flushed out"), fill a glass with tap water. Let the sample sit quietly for a day, allowing discoloration to occur and sediments to settle to the bottom of the glass. Visually inspect the glass for any sediment that's built up. If sediment is present but has a rusty, flour-like appearance, then it's likely that your water contains little, if any, iron bacteria. If you see reddish sediment with a fluffy, three-dimensional appearance, or sediment that looks like strands of strained cotton fibers, then it's very possible that you have iron bacteria infesting your water. Generally, iron bacteria thrives best in soils that are sandy or high in organic material. If the soils around your home have high loam or clay content, your chances of having iron ochre are lower. Methods to eliminate iron bacteria can cost thousands of dollars and are almost always short-term solutions. There are chemicals on the market that can remove iron ochre stains. However, these stains will reappear quickly as new iron-ochre-laden water comes in contact with these surfaces. Iron ochre can affect a home and its inhabitants in many ways, the worst being damage to your pipes and plumbing systems. Stains: Iron ochre stains anything it comes in contact with, including laundry, sinks, and tubs. The porous surfaces of concrete will absorb iron-ochre-laden water, leaving deep stains that are especially difficult to remove. Iron ochre has also been known to leave an oil-like, rainbow-colored sheen on water. Smell: Iron ochre has a foul smell that's often described as musty, oily, swampy, or like sewage. Some homeowners have also described it as smelling like rotten vegetables or even cucumber. Iron bacteria in water also raises the chance of sulfur bacteria infestation, which smells like rotten eggs. Taste: Iron ochre affects the taste of drinking water, giving it an unappealing taste. Health Issues: Iron bacteria itself has no connection to health issues. However, as it adds organic material to water, it may encourage the growth of other bacteria. We Have A Drainage Solution For Homes With Iron Ochre! WaterGuard® IOS® is the ONLY cleanable, flushable iron ochre system of its kind -- the ideal solution for a home with iron bacteria in the groundwater! If you'd like to keep your basement dry and free of iron ochre infiltration, call or e-mail us today! We offer free, no-obligation basement waterproofing quotes to homeowners throughout our service area. 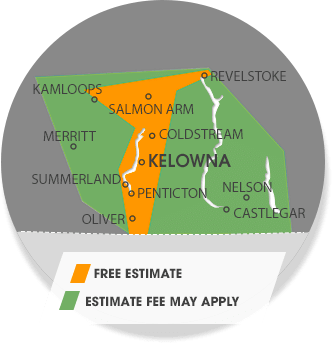 Our service area includes Vernon, Kamloops, Kelowna, as well as Quesnel, Penticton, Williams Lake, Nelson, Salmon Arm, Castlegar, West Kelowna, Trail, Coldstream, Winfield, Westbank, Armstrong, Chase, Oyama and many areas nearby.